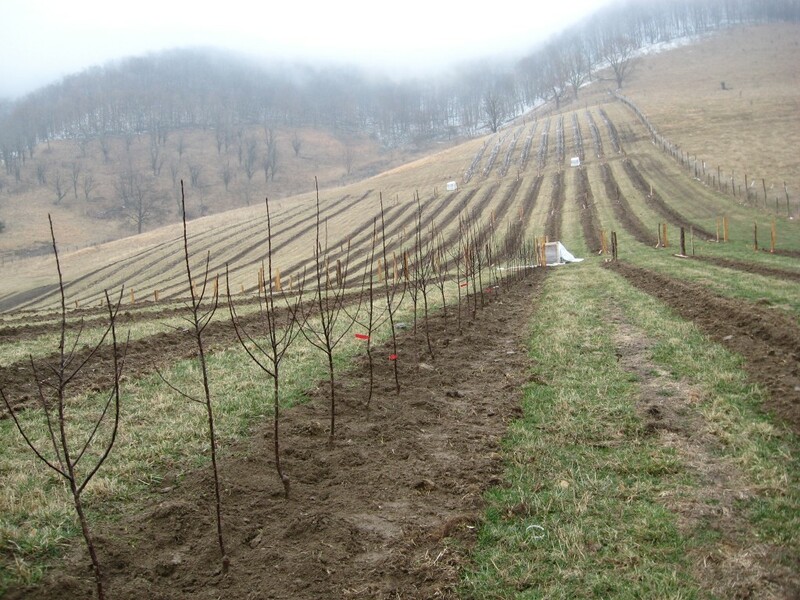 After seven days, two blizzards, one heat wave, wind gusts to 50 mph, 4000 holes, and one unexpected day off, the apple orchard at Sweet Rose has been planted. 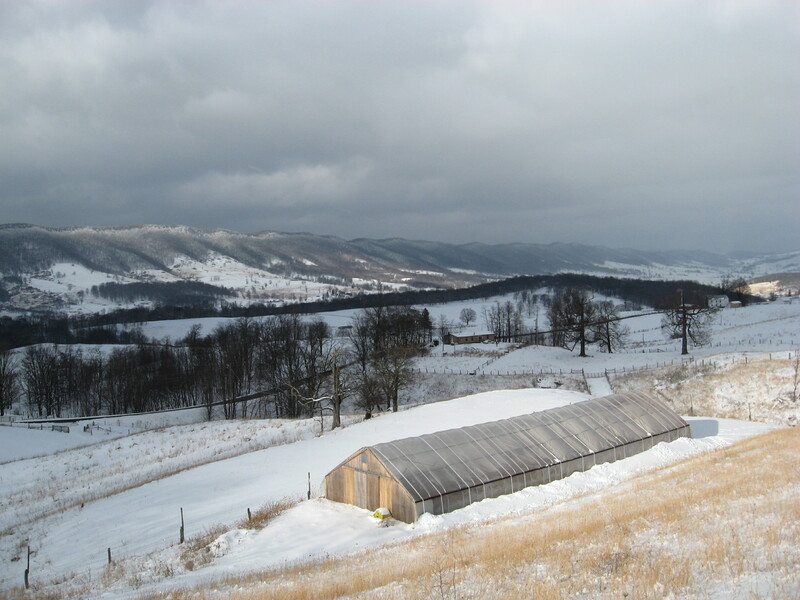 The forecast turned cold and snowy when we started planting the Honeycrisp. The trench I had plowed filled with snow but the hourly forecast called for the snow to be short lived. 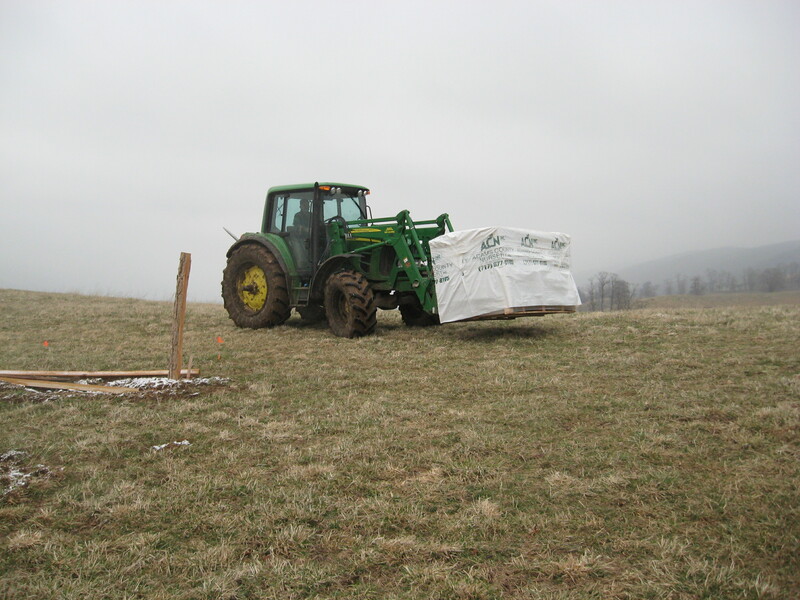 It wasn’t and we planted in snow, snow pellets, snow grains and a little sleet too. And then the wind came. At it’s highest I think it reached 50 mph. We lost the cupola off the barn and at times we all lost our balance working up the mountain. Our work day was cut short and we lost any advantage we had coming into the week. But things would pick up with the new day. 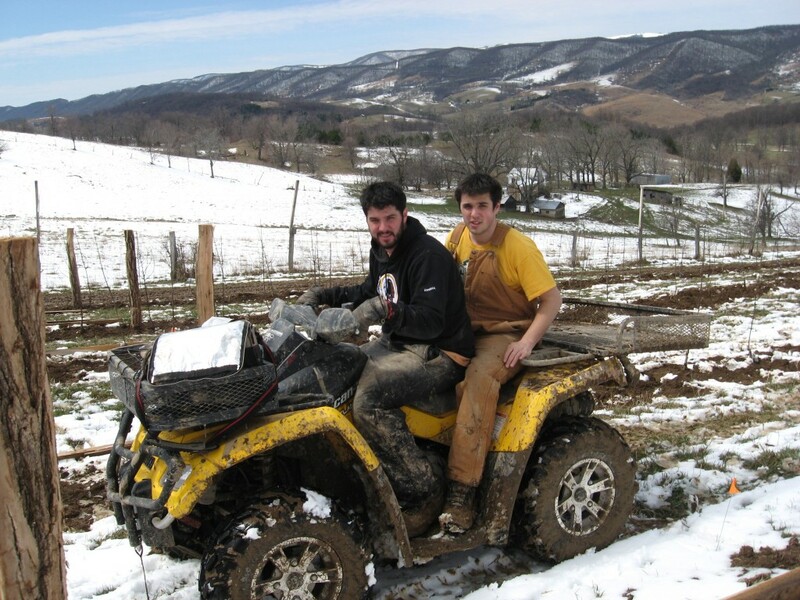 As quickly as the snow hit us, the warm came in the next day and we worked in shirt sleeves…and mud. The snow melted in the trench and it was thick shoveling, even the 6 to 8 inches needed to set the tree correctly. Boots got heavy but we slogged on and actually reached the halfway point. 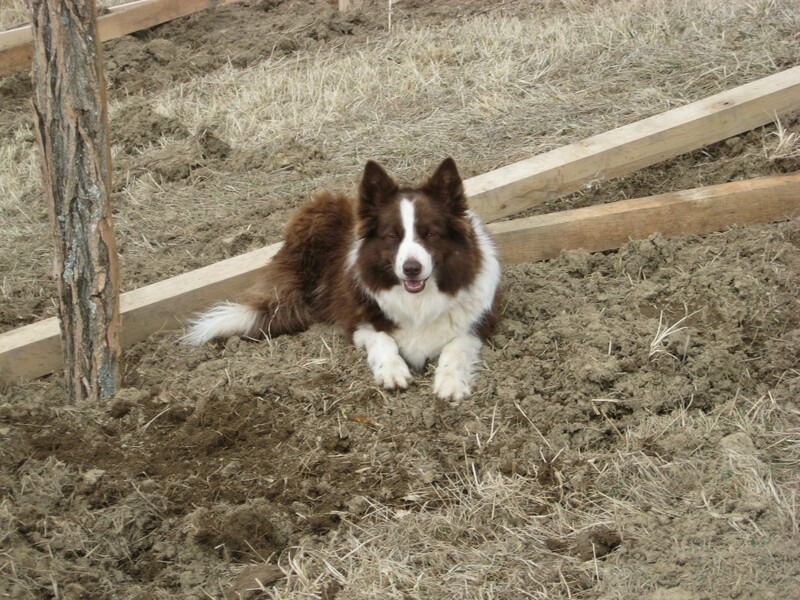 As you can see the snow was melting fast and we had to switch modes from blowing snow to thickening mud. But hey, anyone can plant trees in ideal conditions. The high winds throughout the week caused the planted trees to rock back in forth and work themselves loose. Couple that with planting in the snow and this led to some blown over trees. Jackie came to the rescue and got them standing up straight again. Jackie, Kip and Rose, stand up straight now! I had a little set back in day 4 where I got dehydrated and had to rest a day. 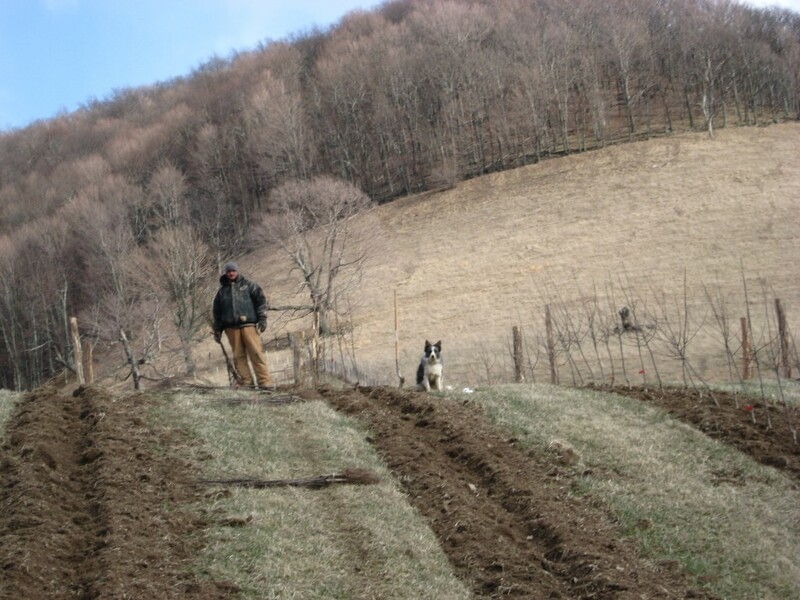 It was probably just as well since the orchard rows dried out and we were able to move the dirt and trees around a lot easier. Over the last through days, we were starting to refine our methods and what started out as a two minute a tree pace, we were able to knock that down to a minute a tree and we started to make up some ground. And so on day seven, we were able to place the last set of trees and finish the job. As we came off the mountain, the rain started to fall. So after three years of planning, the apple orchard is now a reality. Thanks to Jackie, Dave, Wes and Drew for their work int he field and thanks to Jenn and Katelynn for keeping the home fires warm. And thanks to Rose for encouraging us the whole way. As much as we say it all depends on the weather, it actually depends more on who is there for you when you can’t make it without help. My neighbor Ivan was there for me today. The trees arrived today from Adams County Nursery and Ivan was there to pull them off the semi truck and get them up the mountain. In the snow, and the rain and the mud. Without Ivan’s help those trees would be sitting in my driveway waiting for the rain to end. And it looks like it will be awhile before the rain ends. Six plastic wrapped pallets hold the 4000 trees. The wrap will keep the trees protected until we plant them over the weekend. Ivan was able to get them up the mountain and place them in between the rows. Late in the afternoon I was able to set about 60 trees just to get a feel for planting extravaganza that is to come this weekend. The rain chased me out after a couple hours but I was pleased with the trees, the trench, the dirt and then at the end, the mud. I think this is going to be fun. Thanks again to Ivan and his helper, Richard, for getting the trees up to where I can do something with them. It is good to have good neighbors…with a big John Deere! 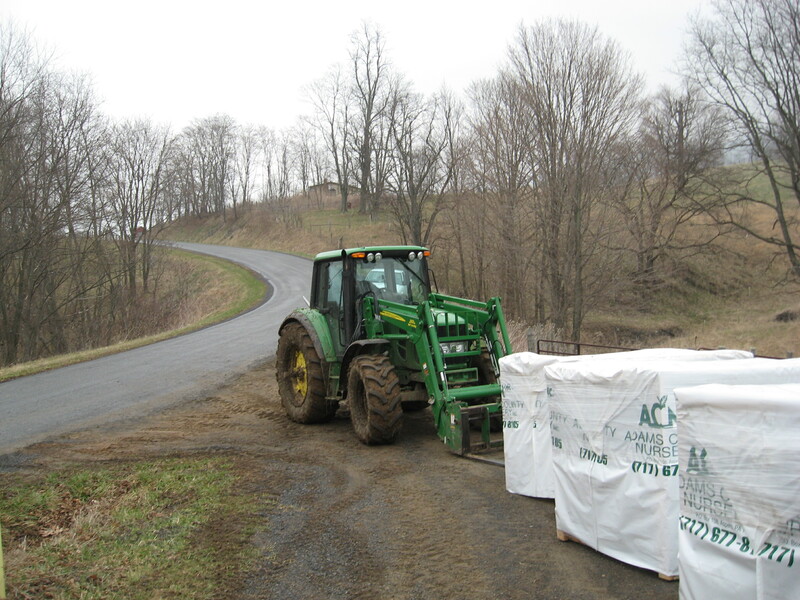 Well everything is in place for the apple orchard planting scheduled for next weekend. Up to a crew of six consisting of sons, friends and wives (I’ll leave you guessing on how many of each!) 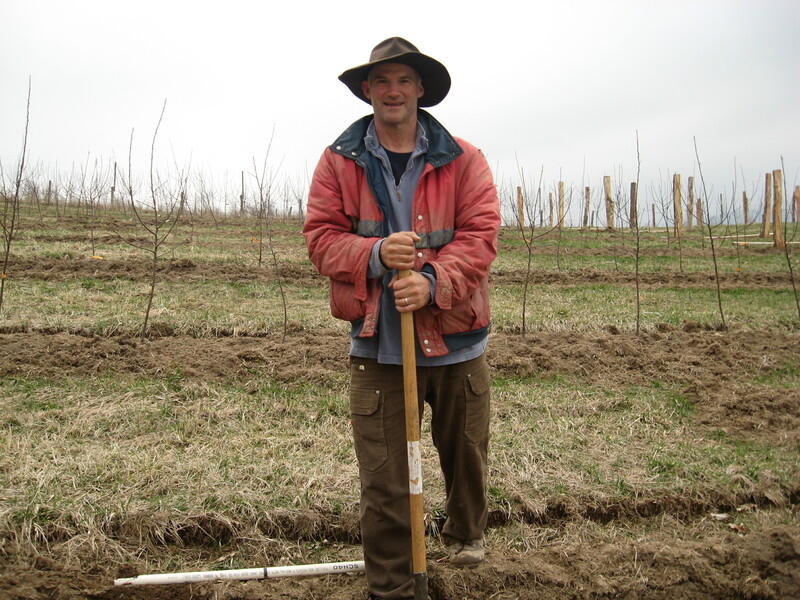 will be on hand to take on 4000 two year old apple trees and finding their spot in the orchard. 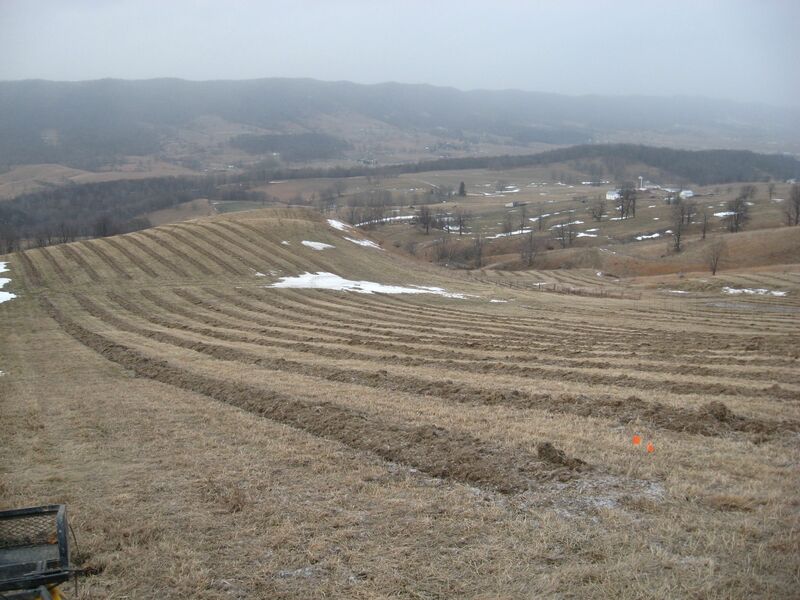 The rows have been plowed one last time, the planting furrow is etched, the end posts have been driven and the trees are set to be delivered on Wednesday. The only thing in flux is, as always, the weather. 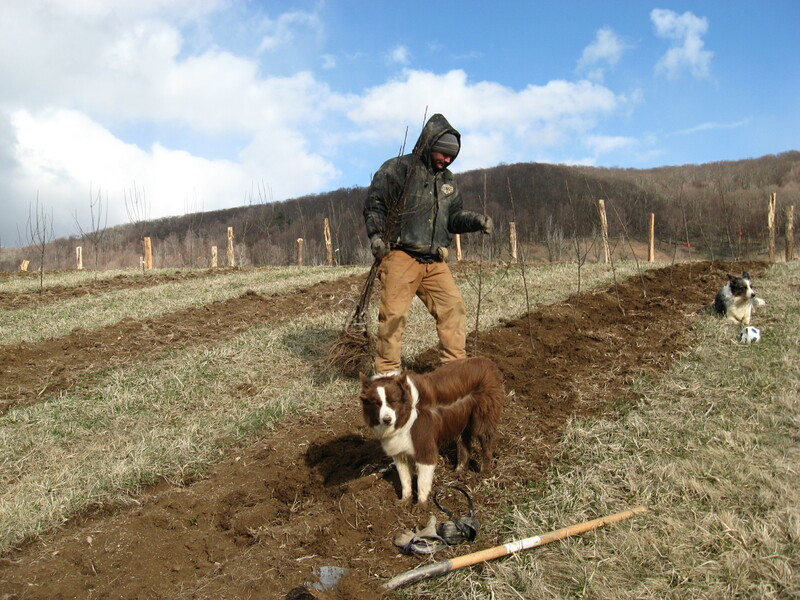 We can plant in the rain, we can deal with the cold weather or the warm weather, but we are going to have one heck of a time if we can’t get the trees up the mountain. Or if we can get them up, can we get down without sliding down the mountain? Tractors, trucks and ATVs will be used to ferry the trees up. And if we can get back down again, hopefully we can come and go as we please. The trees need to be shaded until planting so we won’t be able to take them all up at once. So it all comes down to precipitation. We need very little over the next week. Today we had some snow and hopefully the warm-up will take care of that, however the forecast currently for next weekend has some rain in it. So we will wait and see how fortunate we are come next weekend. Perhaps inviting a couple of pack horses to join the team would be in order! Getting up and down this mountain is the worry of the week! 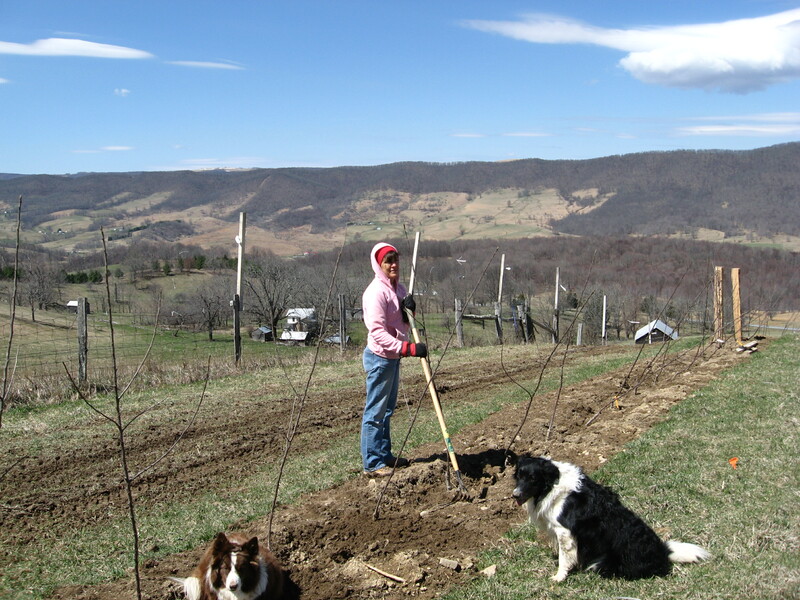 I have been working steadily to get the apple orchard ready. I have driven all the end posts for the trellis and have opened the soil in order to facilitate the actual planting of trees. I have scheduled the delivery of trees from Adams County Nursery on March 30. The tree planting crew is set to arrive on April 1. My son Dave, stepsons, Wes and Drew, and neighbor Dustin Layton will hopefully be able to plant the 4000 trees over the weekend and on Monday. I have been fortunate that the weather has dried out the mountain enough for me to move around the steep slopes in the orchard. You can see some of the spots when the grass has been turned into mud from my driving to the top after each row. The orchard consists of four sections. 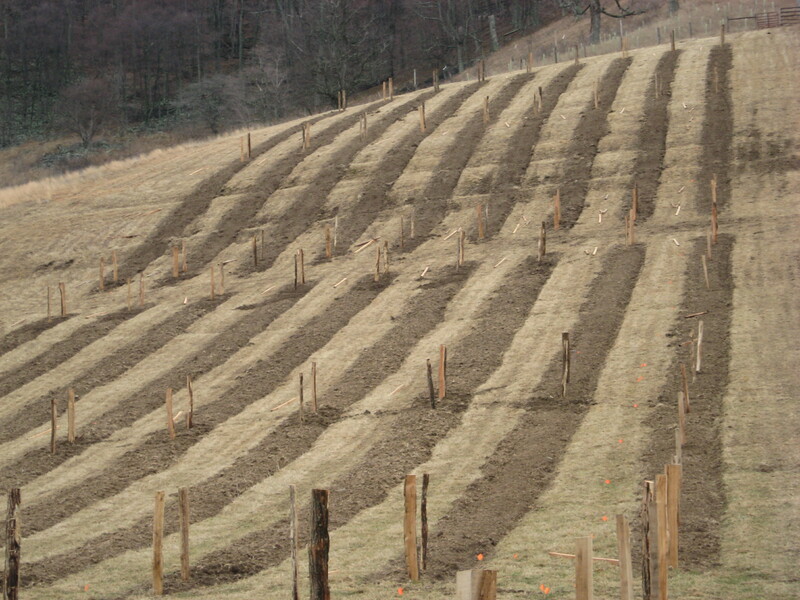 The rows in three of their sections are 300 feet long and each row will have 100 trees. 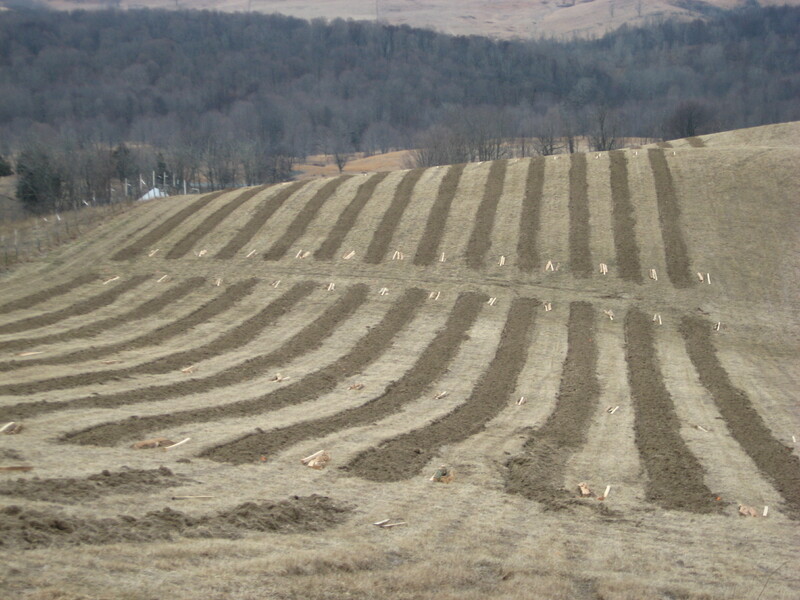 The fourth section has rows 150 feet long and will hold 50 trees. 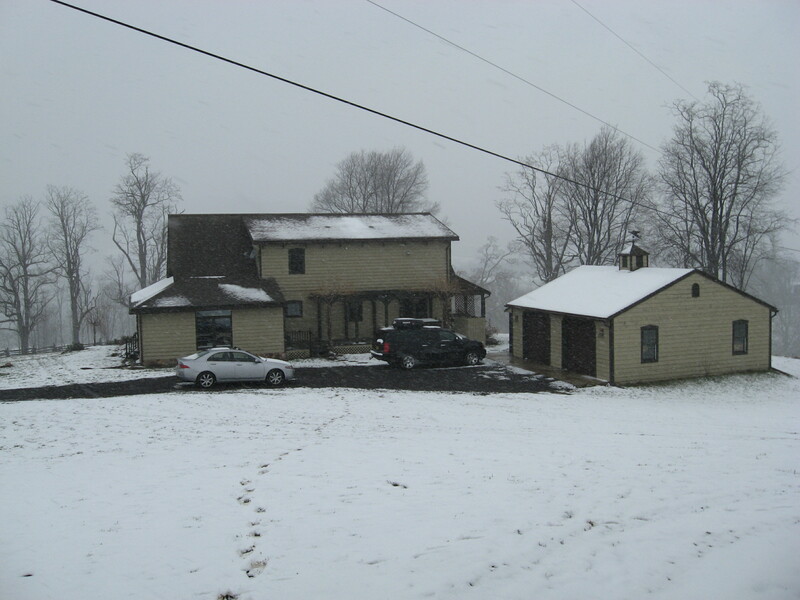 The picture here is of the top most section with an elevation of about 3800 feet. It is a lot steeper than it looks. Last week, Ivan informed me he had a heifer ready for market. On Tuesday she weighed in at 1240 pounds and delivered to T & E Meats in Harrisonburg. The flash frozen vacuum packed beef should be ready in a couple of weeks. I chose T & E for their commitment to the farmer as well as their concern for “ecological-grown artisanal meat”. So we are excited to start this venture and see if we can pull it all together. Call me or email me if you would like to try a cut or two! With the help of my very efficient web master, Frances Bevington, I have now created a “Products Fo r Sale Now” page where you can find everything that is growing or ready for sale at Sweet Rose. Currently everything is growing now and not for sale but that will change even if the crik does rise! I have gotten a lot of questions from friends about what I am growing and as you will see, all I could answer was lots of stuff! Since that answer was a a little less than satisfactory, I have listed the products and their expected next harvest dates on this page. Eventually I will include the yield of each harvest and the selling prices of the product, once the harvest begins. If this looks like a lot of work, it is! And that is just keeping this page up to date, never minding that pesky part of planting, growing and harvesting Certified Naturally Grown produce . I am going to give this inventory page a shot though, because I think this is what a educated and concerned consumer should consider when planning their food buying and menus. You deserve fresh and healthy food and I hope this page is a start in informing you what a local farmer can do for you in providing what is best for you and your family. Wish me luck! The tomato season has started. Over the weekend I started 225 tomato plants in my green room. I have the seeds on seed mats in organic potting soil. I laid out Black Cow processed cow manure on the rows in the high tunnel. I also added green sand to rows to help break up some heavy soil. Next task is to patch up the high tunnel and lay out the irrigation system. The high tunnel took some damage in the 60 mph winds we had over the past few days. We lost 5 of the 12 straps that run over the top and the holes in the plastic at the top have opened up again. I will try some new techniques to avoid this in the future. I’ll have some repair pics next week. 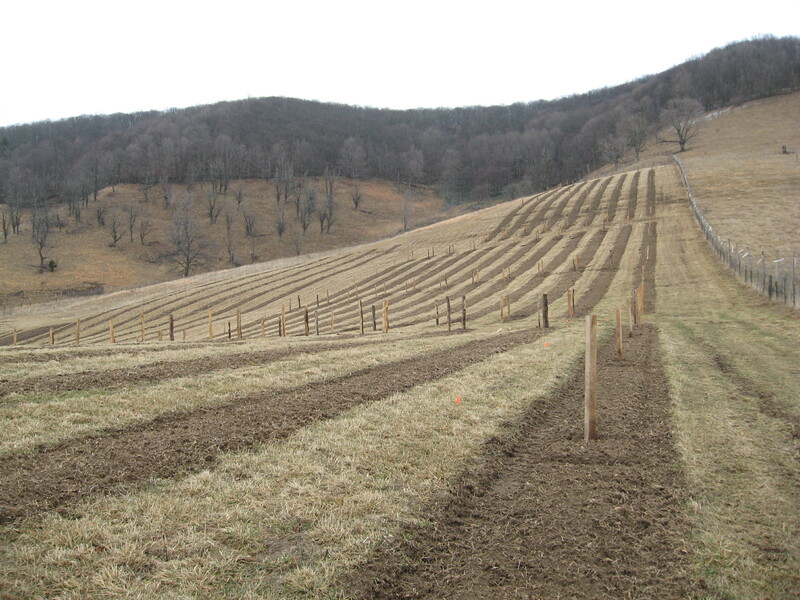 I completed moving the locust posts into position alongside the rows in the apple orchard. I hope to drive all these posts as the main supports for the apple trellis. I moved some last week but had to wait for freezing temps to harden up the road up after it got too muddy and lost my traction up the mountain. I got that on Saturday morning with temps at 28 at 8 am. I was able to make 8 more trips up the mountain and finished laying the posts and their braces out. I am hoping to get more good weather during March to drive these posts before the trees arrive around the first of April. More on the trellis design and construction later. I was down at Ivan’s Sugar Shack watching the maple water entering the holding tank. 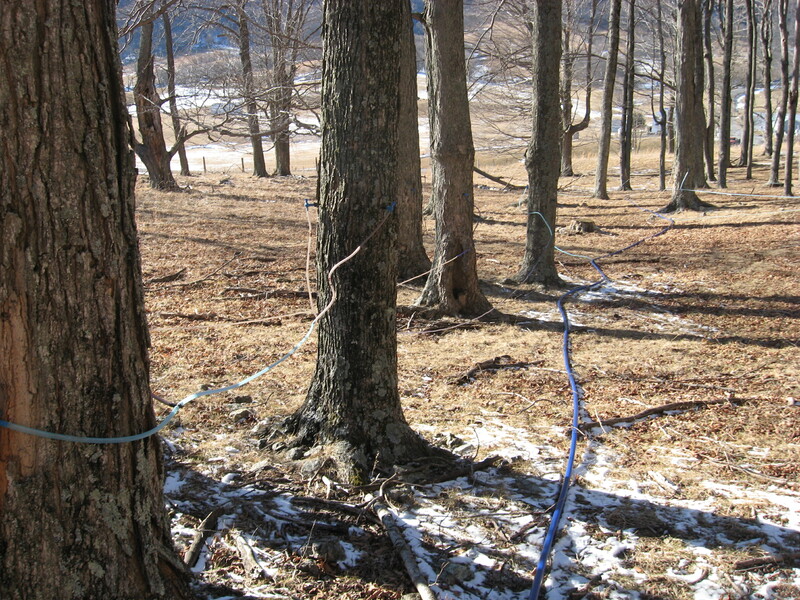 The trees started running in earnest a couple days of go and the miles of tubing used to link the trees to the tank are channeling the maple water into the sugar shack. 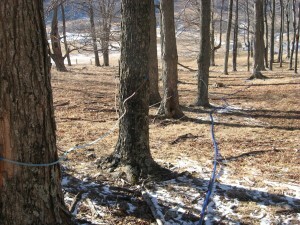 Here are some of the trees I worked on setting up the tubing. From there Ivan runs it through an osmosis machine to remove water and then starts the boiling process. As the water boils down it is moved to a second boiler where Ivan watches the consistency and color of the mixture. It is not quite syrup yet and at 213.1 degrees, the mixture is drawn out of the boiler automatically into a holding tank. From that holding tank, Ivan transfers it to a larger tank for cooling. Once cool, back into a final boiler to finish off the syrup. Once done, the syrup is pumper through a filtering system and then bottled while the syrup is still above 180 degrees. Ivan estimates he made 140 gallons of Grade Fancy Maple Syrup on this first full day of syrup making. 280 eight foot locust posts and 240 ten foot oak 3 x 3’s sit piled at the garden gate. They all need to get on up the mountain. I hope to drive some of the posts before planting the apple trees, so the first order of business is to get them laid out in the row. The thaw last week removed the snow but as the week warmed, the ground thawed too. The road up got slick with mud so I was only able to get about half the lumber up and laid out. So now I need a freeze to harden the path up to finish the job. And I just may get that next week.